I recently had the opportunity to ask Tina some questions, you'll find some of her answers below. 1) How did you decide to choose this story as your first to tell? I have been carrying around this story inside me since the age of 8. Growing up in a rural town in Northern Ontario, we spent a lot of time playing outside. Our house was in a new subdivision which was very muddy, due to construction, and had lots of treed property and forest around us. In those days, our imagination was our FAVOURITE TOY. We built tree forts, we made up our own games, we spent a lot of time playing make-believe. I guess I’ve always had a creative spirit. At age 8, I remember writing (a very basic!) play for the neighbourhood children to act in. I called it "Rindicella and the Size 13 shoes". I had 3 older brothers who loved to tease me. My diminutive (or affectionate name) was Kristinka, so of course, they managed to come up with "STINKA". My oldest brother owned a pair of size 13 running shoes; since I had extremely large feet for a small girl, it was difficult to fit into high heels. Hence, I came up with the idea to use his large shoes, in place of the glass slipper. About a year ago, I was thinking about that time of my life, and how it launched my career as an actor and director. I began to write down the story I had written way back then and made adjustments to whom I am now and how I remembered it from an adult's point of view. 2) What do you hope young readers take away from the story? We are, all of us, challenged in some way growing up. Perhaps it’s a birth name or last name that lends to a funny rhyme, and we end up being teased incessantly. Perhaps it’s something physical we don’t like about ourselves and wish we could change. 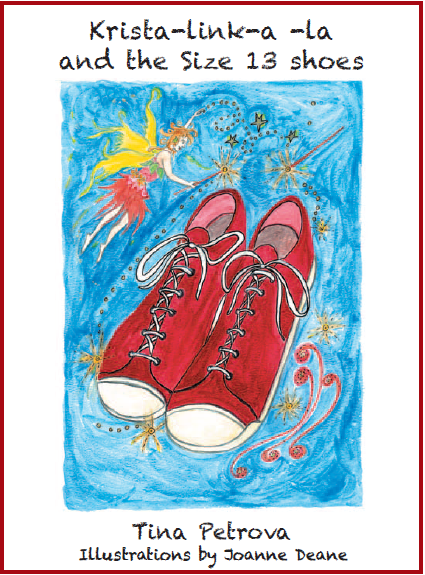 In my instance, I wore size 9 shoes at age 8 which made me stand out from other girls with dainty shoes. We have a choice to be upset by these things and get angry or withdraw, or to turn them around and celebrate them. I guess the point I wanted to make is that in every moment, we have a choice of how to react to situations. By having Krista-link-a-la overcome her unhappiness with her big feet by celebrating them --- even showing them off, we demonstrate how to change a negative into a positive. Instead of crying about the nickname she despised, she made a choice to re-write her 3 brothers as the 3 wicked stepbrothers in the classic Cinderella tale, with her triumphing over the nickname and teasing, by becoming the heroine of the story. 3) How was it decided to use real photographs at the beginning of the book and then drawings? The idea to use photographs at the beginning then move to illustrations came from the fact that little Krista-link-a-la emigrated from another country to Canada, and that life looked very different to her new life. By using actual photographs of her family's small village and inhabitants, I wanted to offer a storybook that children of all backgrounds could relate to. Many of us in Canada are the 1st or 2nd generation of some other culture that settled here. Whether that be Jamaica, Europe, Mexico etc., that country had different cultures and customs. My intent was to show that Krista-link-a-la drew from the gifts and heritage of her own culture to find a way to fit in and adapt to her new world. I wanted parents or kids reading it to say: “I came from somewhere else, too!” or “My grandma and grandpa came from somewhere else. I can relate to that.” There are not enough stories out there that offer ethic diversity- I hope to fill that gap. Although my grandparents were born in Canada and I grew up as a city girl, I can still relate to this story. In grade 7, a boy discovered my name backwards is Haras...he added an extra S and I was Harass for the rest of the year. Everyone, everywhere gets teased for things they can't control, and I also hope that this story will teach that you can put a positive (even creative!) spin on anything. You can purchase Krista-link-a-La and the Size 13 Shoes here. Keep your fingers crossed that we will get to read more adventures of Krista-link-a-La soon!